Do you have an above-ground swimming pool in your backyard? Do you find yourself struggling to keep the water clean even though you perform regular maintenance and filter cleaning? Do you think it’s time for a new filter? 1. How much time do you have to devote to cleaning? 2. Have you ever set up a filter before? 3. Will you be able to monitor your filter daily? 4. Do you have any issues with your water quality? 5. Will you be using a microfilter or another type of filter or saltwater device? When it’s time to upgrade your above-ground pool filter, we’re here to help! In this article, you’ll get a crash course in choosing an above-ground pool filter, and you’ll be able to compare and contrast between seven of our top choices. Once you narrow down your options, you can choose the best filter for above ground pool use in your own backyard. No matter what size pool you have or how often you use it, you should have no trouble finding the best swimming pool filters above ground pools can use when you keep our tips and reviews in mind. Take a look at these great products and determine which one is best for you. You and your pool will both be happier when you do. Are you ready to get started? Let’s learn about above-ground pool filters! Below, you’ll find seven of the best above-ground pool filters on the market today. You’ll be able to choose between cartridge and sand style filters to help you find the right amount of power, filtration, and price for your pool setup and your needs. Remember that sand filters tend to be a little more powerful overall than cartridge filters, but that you may need to purchase a stronger pump if you plan to replace a cartridge filter with a sand one. On the other hand, if you’re replacing a sand filter with a more affordable cartridge style option, you may need to purchase some adapters to make the connection work. Read on to find the right filter for you. The Blue Devil B8315 Sand Filter is a durable little sand filter that can give you plenty of filtration for a smaller swimming pool. Although this filter isn’t large enough for more frequently used pools or for larger ones, it’s a great way to bring home all the benefits of sand filters to a pool that might not be as frequently used as others. Install it quickly and easily with a simple setup procedure and you’re sure to find out just what makes this filter a great choice for your pool. This is one of the most affordable sand filters for above ground swimming pools on the market today, especially for above-ground pools. You can use this filter with traditional pool sand or with an alternative. The filter comes with a built-in stand to make it very easy to place and safe to operate. This filter isn’t very strong, so it might not be enough for larger pools and may require a more powerful pump. This is a lesser-known brand name product, which may be a negative to some customers. 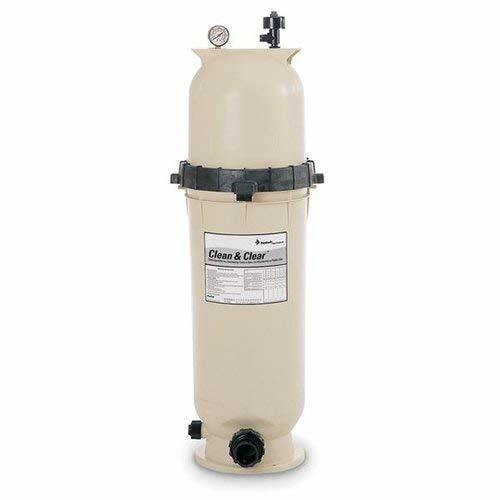 If you’re looking for an affordable way to get started with a sand filter, look no further than the Rx Clear Radiant 22-inch Above Ground Swimming Pool Sand Filter. 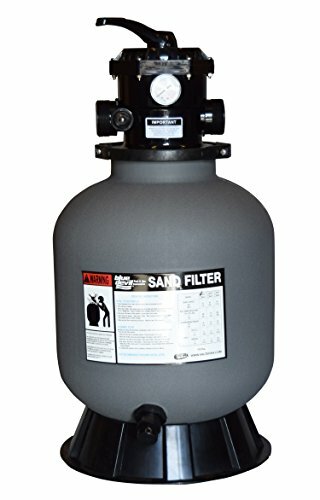 This is a durable little filter that can give you a lot of great filtration at a fraction of the cost of other sand filters on the market today. 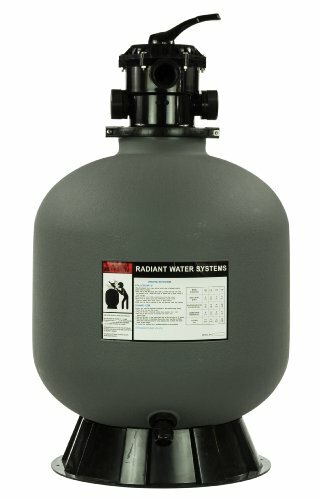 It’s available in a neutral gray and black color combination that helps it blend in nicely to just about any backyard setup, and it’s simple enough to install even if you don’t have prior experience with sand filters. This is one of the best sand filter for above ground pool options on the market today. This is an affordable product that’s sure to fit into just about any budget. With this filter, you will only have to backwash about once a month. You can use this filter with traditional pool sand or choose to use an alternative instead. The included directions are written in a complicated way and may be difficult to understand at first. The valves included with this product have been known to break and become damaged frequently. May not be large enough to work with bigger pools, and may require a more powerful pump. The Hayward C550 Easy-Clear Filter is a great way to provide plenty of filtration to your swimming pool even if you don’t want to spend a lot of money to make that happen. This filter is a cartridge style option that comes from the well-known Hayward company. This is a very popular company that is known for its excellent product line and commitment to customer service as well as quality control. When you bring home this small filter, you’ll be able to provide plenty of clean, fresh water for your pool, especially if it’s a smaller one or you don’t use it as often. Although this filter may not be strong enough for larger pools, it’s a perfect choice for smaller ones. This is an incredibly high-quality filter for the price, and it’s great for lower budget pool setups that require above ground cartridge pool filters. The filter comes with a starter cartridge that can last you for several months until you need to replace it. Replacement cartridges that fit this filter are easy to find. You will need to spend more on replacement cartridges for this filter than you would for replacement media for sand style filters. This filter has been known to arrive with small cracks or leaks, although the company will replace broken pieces. The filter doesn’t come with an attached base, so you will need to figure out a base setup separately. 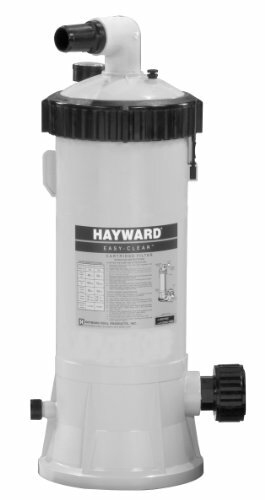 If you’re looking for a strong cartridge style pool filter that won’t break the bank, look no further than the Hayward C7512 Star-Clear Plus Cartridge Pool Filter. This is one of the more affordable Hayward products on the market today, but you don’t have to worry about whether or not this filter is skimping out on any quality. This is just as strong and precise a filter as any other Hayward product, but at a fraction of the cost. It’s great for smaller pools and those that aren’t used as regularly, and it can provide a ton of filtration without a lot of hassle. This filter is almost as powerful as sand and DE style filters, which is very hard to find with cartridge filters. The filter comes with a starter cartridge so you don’t have to worry about buying one separately for a few months. If you perform proper cleaning and maintenance, cartridges can last you for up to a year easily. You may need to purchase separate valve adapters for this filter depending on the type of pool you have. You will need to purchase separate cartridge filter media for this pool filter. The o-rings in this filter will stretch out and become worn after several uses and cleanings. 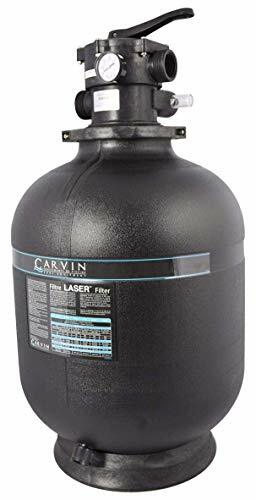 The J﻿﻿acuzzi Laser 19” Inch Abov﻿﻿e Ground Swimming Pool Sand Filter is a great option when you’re looking for something to use with your Jacuzzi brand name pool. Although this product is designed by Jacuzzi and made to work specifically with these products, however, you can still use it with other pools as long as you have the proper adapters in place. This is a very strong filter that gives you a lot of bang for your buck, and when you have it installed, you can expect incredibly clean pool water for a very long time to come. As an added bonus, it’s a sleek black color that looks great in any backyard setup. This filter comes from a well-known brand name with plenty of great customer service to help you with any problems. The assembly for this filter is very easy to understand and perform even without prior experience. This filter has been known to last for over ten years with proper maintenance and cleaning. You will need to backwash this filter more frequently than some other sand filters. You may need to purchase adapter pieces to hook this filter up to a non-Jacuzzi brand pool. The filter doesn’t come with the pump, so you’ll need to make this purchase separately. When you need a powerful and durable cartridge filter for above ground pool use that isn’t too big, you need the Pentair 160317 Clean & Clear Reinforced Cartridge Pool Filter. This is on the high end of quality products in terms of cartridge style above-ground pool filters, and you can’t go wrong with the Pentair brand. This powerful little filter can do a lot in terms of getting your water cleaner than ever before, and even though it’s small, it packs a punch. The filter comes with a reinforced design to help protect it against wear and tear, even in the inclement weather. If you have a smaller in-ground pool, you can also use this filter for this type of pool. Easier to install than many other comparable filters on the market today. Regular cleaning is very easy with a simple sealing mechanism on the lid of the filter. The filter has been known to arrive cracked or damaged, but the company will usually replace broken pieces if this happens. The filter doesn’t come with a separate stand piece, so you may need to purchase this separately. Replacement cartridges may be expensive and cause more cost over time with this filter. Are you in the market for a large and very powerful cartridge style above-ground pool filter? If so, the Hayward C2025 SwimClear Large Capacity Cartridge Pool Filter is a great option for you. This is an incredibly strong and durable filter that’s designed with lots of use in mind, and it’s a great choice for even the busiest of swimming pools. Some commercial pools even use this product, so you know it can handle a lot of regular use over the course of the summer—or even the whole year, if you live in a place where your pool can run all year long! This is one of the most powerful cartridge filters available. 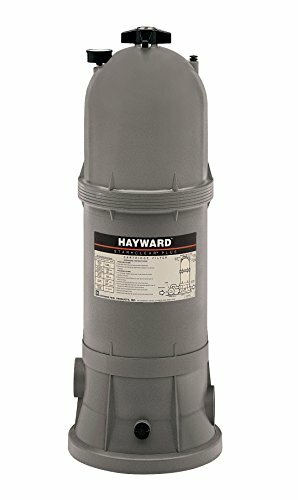 Since it comes from the Hayward brand, you can expect a great product and excellent customer service with this filter. This is a huge filter that can handle a pool no matter how often it’s used or how dirty your water might be. This is a very expensive pool filter, especially for a cartridge style filter. You will need to purchase several new cartridges for this filter every time you replace them, so this will be even more of a cost to incur over time. This filter may be more complicated to clean than other similar filters on the market today. When you shop for an above-ground pool filter, you need to make some different considerations than you would for an in-ground filter. There are a few differences as well as a few similarities between these types of filters, so check out this list to help you get started. Pool size – The size of your swimming pool—that is, the width and length of the pool—has a huge impact on the type of filter you choose. Bigger pools require filters with a larger area, so be sure to choose a filter that matches the size of your pool. Above-ground pools are usually smaller than in-ground ones. Pool capacity – This refers to the volume of water the pool holds. This also affects the size pump you choose, but it can help you decide the size of filter you need as well. The filter and pump should always be compatible with each other in terms of size and power. Once again, these pools are usually smaller in terms of volume than in-ground pools. Frequency of use – If you use your pool often, you’ll need a filter with more power than you would if you only use the pool once or twice a week. If you have kids or pets who swim in the pool often, or if you frequently get sunscreen or lotion in the pool water, you may have a greater need for a powerful filter. And if your water is generally very hard, a stronger filter may be required. A cartridge filter may not even work if your water is incredibly hard. This is important to consider whether your pool is above ground or in ground. Pool location – If your pool is located in the direct sunlight in your backyard without any protection or shade, you will need to choose a filter that can stand up to a lot of inclement weather. Frequent beating sunlight, as well as frequent rain and wind, can all cause damage to your filter over time. Be sure to stick to one that can keep functioning properly without develop leaks or breaking even when the weather isn’t perfect. Above ground pool positioning is usually more of a concern than it is with in-ground pools. Pool type – Are you shopping for a permanent above ground pool or are you looking for a filter for a pop-up pool instead? Pop-up pools generally can’t be used with stronger filters, so be sure you choose one that works for the right type of pool. Budget – Last but not least, your budget may affect your filter choice. Cartridge filters are more affordable to set up initially but may be more expensive overall as you need to buy more replacement cartridges. Sand filters are more expensive to set up but will be cheaper over time without the need for frequent media replacement. This is a concern regardless of the type of pool you have. Although we’ve already discussed the differences between above ground and in-ground pool filters and what you need to look for when shopping for one as opposed to the other, there are a few things you need to consider when you’re shopping specifically for an above ground filter. Check out our list of tips below to help you choose the right filter every time. Cartridge filters require much more rigorous cleaning than sand filters, which can simply be backwashed once a month. However, sand filters need to be cleaned more frequently than cartridge filters. The amount of time you have to devote to cleaning can help you choose the right type. If you have no experience with a pool filter, you may have an easier time learning a cartridge filter than a sand filter. However, even with just a little experience, you should have no issues learning a sand filter. Both may be equally challenging to install with no experience, but the filters listed here are all easy to install without additional assistance. Sand filters require daily checks to be sure the pressure gauge is at the right number. Cartridge filters can be checked weekly with no real issue unless you notice your pool water getting grimy in between checks. If your water is very hard or if you have noticed a lot of algae growing in your pool in the past, you might want to choose a sand filter, which is generally more powerful than a cartridge filter. On the other hand, if the water you use for your pool is usually of a good quality, you shouldn’t have any trouble using a more affordable cartridge filter. Depending on your answer to this question, you may have better luck with one type of filter over another. Microfilters generally work best with cartridge style filters. Saltwater devices and ozone filters work better with sand filters, but they can also be used with cartridge filters in some instances. Both types of filter can be used easily with pool treatment chemicals, however, so you don’t have to worry about the filter you choose changing the pH balance of your pool water. You have a lot of options when it comes to picking the right above-ground pool filter for your needs. But even though it may seem complicated to choose the right one, it doesn’t have to be! When you follow the tips listed above and choose from our top 7 options, you’re sure to bring home the right pool filter no matter what kind of pool you have or what your needs might be. Whether you’re looking for a smaller filter to help clean up a pool that isn’t used too often or you need something huge for a pool you use almost every day of the year, you can find all that and so much more among the many filters available for you to choose from. Remember that you can choose between cartridge style or sand filters when shopping for an above-ground filter and that each one has its own pros and cons. A sand filter may offer more filtration but could be too large and too expensive for your needs. On the other hand, an affordable cartridge filter may be too small for a pool that gets used a lot. In the end, the right pool filter for your above-ground pool is entirely up to you, but we can help you make your final decision. Pick your favorite from our list and get ready to experience the cleanest, healthiest pool water imaginable!